It’s been threatening to rain for a few weeks now, and this weekend it finally did. Not quite soon enough though; most of South-East Queensland is now officially in drought. After our first summer up in Brisbane almost four years ago, where it rained relentlessly for months on end, where everything was mildewed and floods wreaked havoc across the state, it has been conspicuously dry. Our grass is now brown, dry and dusty, and no longer needs to be mowed. It is perpetually sunny up here (hence the moniker the Sunshine State). Except for this weekend. It started slowly on Friday, and when we got to the markets on Saturday morning amidst the drizzle it was much quieter than usual; even half the stall holders hadn’t made it along. We got what we came for, but forwent our customary coffee-and-croissant on the grass as it was all too sodden. The rain built up over the day and by the afternoon was coming down pretty steadily. It is rare to see Brisbane beneath a cold grey wet cloud; I almost liked the change in scenery. At about four in the morning on Sunday, when I got up to give W a cuddle and snuggle her into bed, it really started bucketing down. For all that I hate the cold weather there is something oh-so-comforting about lying inside at night listening to the rain fall heavy and loud on a tin roof, flowing through the gutters, dripping off the eaves. By the time we woke up Sunday morning it had stopped raining but everything was wet and glistening. Nice as it was, of course, twenty-four hours of rainfall is unlikely to do much to alleviate the drought for the farmers and rural communities of Queensland. For me, though, it put me in mind to eat a big bowl of pasta and drink a glass of red wine (okay, S drank the wine). By the time we ate this for Sunday lunch the sun was back out, but the memory of the rains was still there! And on the plus side, we were able to walk off the filling lunch by taking W for a sunny stroll up to the park on the hill. I wanted this pasta to be light but delicious. 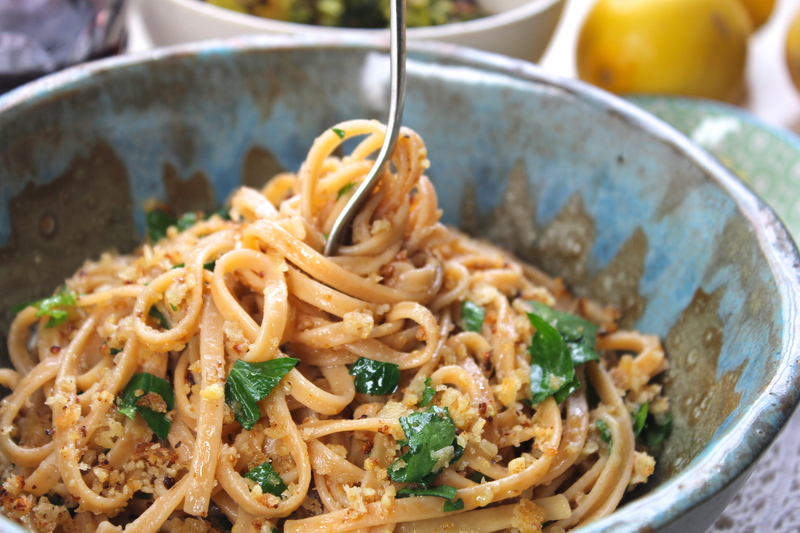 I love using lemon and herbs in pasta and risotto, and after picking up some artisan linguine at the health food store on Friday I dreamed up this Lemon & Walnut Linguine. It was exactly what I was after! Roasting the garlic mellows and sweetens it, and the toasted breadcrumb-walnut mixture gives the whole dish a depth of flavour. 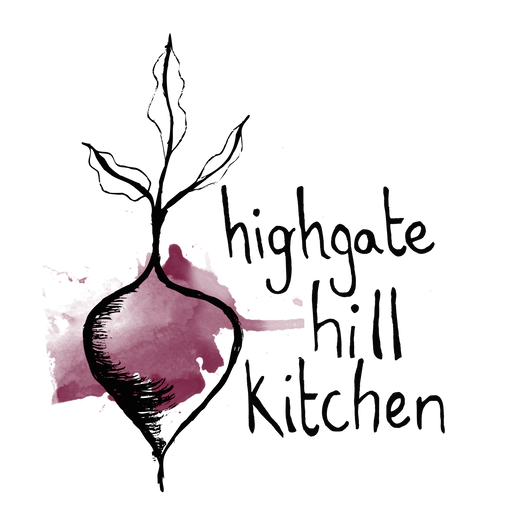 As this is a deliberately simple pasta dish use the best quality ingredients you can find – locally-grown garlic and juicy organic lemons. Rather than store bought bread crumbs, save a couple of slice of sourdough from a loaf and make your own. Find some high quality linguine. I was going to make a salad to go with this linguine, but in the end I settled on roasted broccoli. Just because I LOVE roasted broccoli. It was a beautiful match; in fact you can also stir the roasted broccoli right through the pasta and serve it like that – equally delicious. Either way, next time you feel like curling up with a big bowl of comforting pasta, give this a whirl. Preheat oven to 200°c/400°c. Roast the garlic cloves in their skins for 30 – 40 minutes, depending on the size of the cloves. Take out of the oven and when cool enough to handle peel, remove the tough end, and set aside. Cut the broccoli into florets, halving them if they are large. Toss through with a glug of olive oil and a pinch of salt and lay flat on a baking tray. Pop into the oven preheated from the garlic and roast for 25 – 30 minutes, until the edges are starting to brown. When they come out of the oven toss them through with the rind of half a lemon and the chilli flakes and serve hot. While the broccoli is roasting, bring a pot of salted water to the boil and cook the linguine according to packet instructions until al dente. In the meantime add the lemon rind and juice to the roasted garlic along with the olive oil and a pinch of salt. Using a hand mixer, blend until fully combined. Toss the breadcrumbs in a food processor along with the walnuts and pulse until fully combined; it is okay if the mixture is still a little coarse. If making your own breadcrumbs, pulse two – three slices of sourdough until crumbed (just a couple of minutes) before adding the walnuts. Heat a splash of olive oil in a frying pan on medium-high heat and add the breadcrumb-walnut mixture, toasting until it starts to brown and smell nutty – about five minutes. Toss continually to prevent burning. When everything is ready, drain the linguine, reserving about a quarter cup of cooking liquid in the pot. 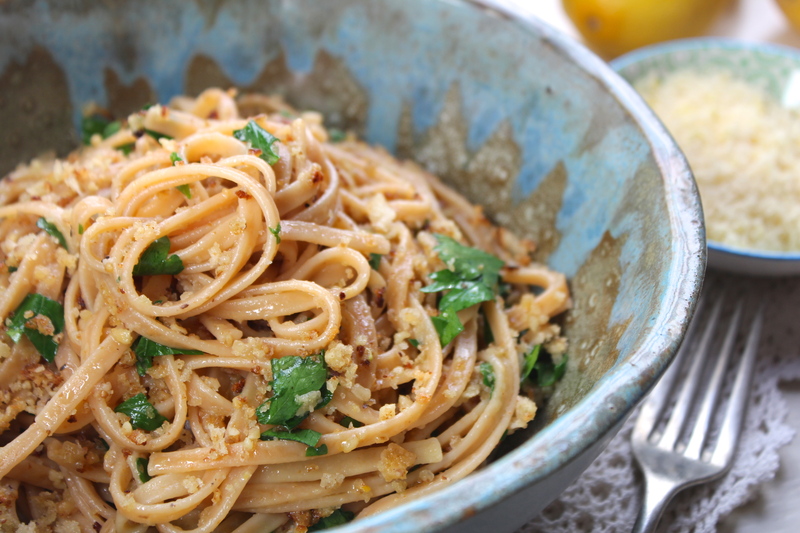 Return the drained linguini to the pot, add the lemon sauce and the chopped parsley, and stir to thoroughly combine. Add about three quarters of the toasted crumb mixture to the pasta. Divide into bowls and top with the remaining toasted crumbs and parmesan cheese, if using. 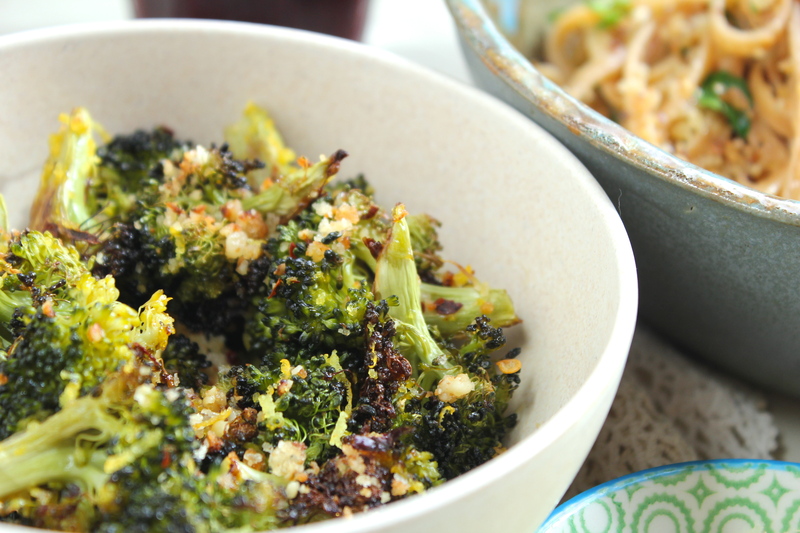 Serve while fresh and hot, with the roasted broccoli on the side. 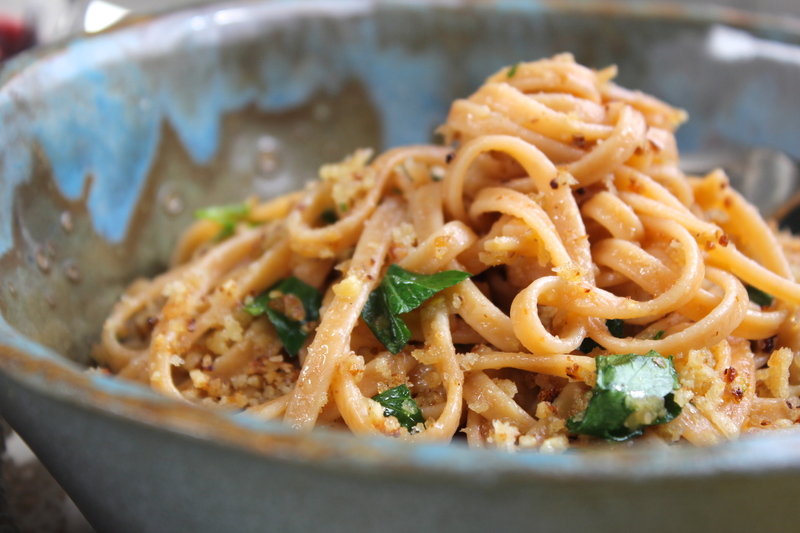 Notes: I used some lovely organic durum semolina linguine for this dish, but it would work just as well with fettuccini or spaghetti, or even gluten free pasta. Thanks! I’ll definitely come check it out. 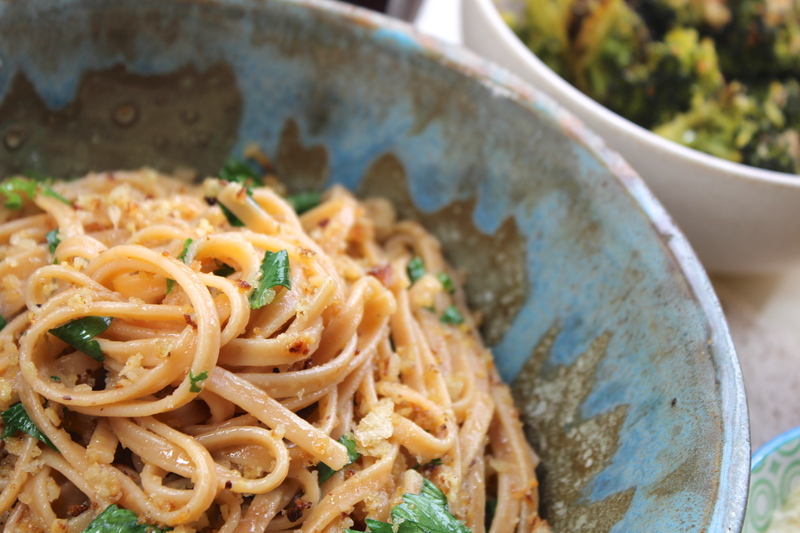 You seriously make the best pasta and grain salad dishes! 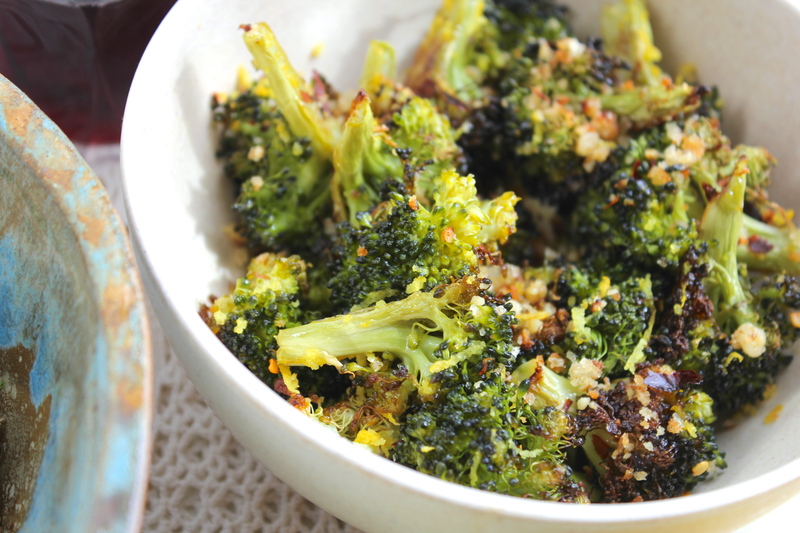 I love roasted broccoli and anything with lemon-walnut. Definitely want to make this soon. Thanks Sarah! That’s probably because pasta and grain salads make up the bulk of what I eat!